When the U.S. government of George W. Bush (2001-2009) decided to illegally invade militarily the country of Iraq and overthrow the government of Saddam Hussein, against the advice of many thinking persons, it opened a “Pandora Box” of woes that is still spewing out its calamities today, and probably will for many years to come. This is the first and foremost cause of the current quagmire prevailing in Iraq and in Syria today. Well, as it should have been expected by anybody who has any knowledge of history in that part of the world, Iraq was far from being a stable “democracy”. Instead, the Shi’ite-led and paranoid Malaki government was everything but “inclusive” of the Sunni minority. Indeed, the Shi’ite-controlled Iraqi government was bent on taking revenge on the Sunnis for the suffering Shi’ites endured under the dictatorship of Saddam Hussein. Using the sophisticated military gear supplied by the U.S., it tracked down Sunni opposition and dissenters to the regime, many were killed, and it excluded prominent Sunni politicians from the government. There lies the second cause of the Sunni revolt that has helped create the terrorist organization known as the Islamic State militia (IS), [also known as the Islamic State of Iraq and the Levant (ISIL)], whose fighters are often foreign volunteers, at least in Syria. Some are ethnic Chechens, and many come from western countries such as the U.K. —When one sows terrorism, one should expect to reap terrorism. And that’s what the U.S. government and some other western countries have got in Iraq and Syria. In the U.S. case, it is for invading the former militarily and for reneging on its obligations to behave as a responsible occupying power under international law. Added to that ill-thought and improvised U.S. policy in Iraq was the incoherent and misguided American policy of destabilizing the neighboring Syria by supporting and arming Islamist rebels against the established Assad government, in association with the Sunni governments of Qatar, Saudi Arabia and Turkey. These three countries had political and economic reasons of their own to oppose the Syrian Assad government, but not the United States. Many of these American-supported “moderate” Islamist terrorist organizations have since been absorbed by the rabidly terrorist ISIL organization. One can hardly think of a more flawed policy. Last year, while the religious totalitarian terrorist IS organization was gaining strength both in Iraq and in Syria, and U.S. ambassadors in those countries were sounding the alarm, the Obama administration’s attention was concentrated on overthrowing the elected government of Ukraine and on overthrowing the Assad regime in Syria. Now, the IS militia are well entrenched in many cities and well armed with sophisticated American-supplied weapons that they have used to terrorize, torture and slaughter thousands of people who oppose their lunatic views, both in Iraq and Syria. That’s a total mess. But what does the Obama administration do? Faced with a most serious humanitarian and military crisis in Iraq and in Syria that the United States itself has ignited with its policies, President Obama, surrounded by his neocon advisers (whose real allegiance is most dubious), has appeared hesitant, confused, overwhelmed, clueless, incoherent, passive and reactive. The old saying “A stitch in time saves nine”would seem to apply here. Indeed, problems tend to pile up when solutions are postponed and delayed. The brutal monster of IS in Iraq and in Syria has been allowed to develop and grow because of the U.S. government’s wishful indifference in Iraq and of its misplaced policies in Ukraine and in Syria. The result has been a Washington D.C.-made quagmire in those countries. It is not exaggerated to say that the U.S. government has blood on its hands for the savage carnage taking place in these countries. How could the world stand still when fanatical and delusional seventh century barbaric butchers slaughter people right and left, for their ethnicity, their religion or their ideas? There is a word for that savage behavior, and that is “ethnic cleansing”. It is genocide. The sad truth is that for the last twenty some years, there has been very weak intellectual leadership in Washington D.C., and this at the highest echelons. Ruinous wars and costly financial crises have resulted. In the future, the Clinton-Bush-Obama years will probably be known as the “Vacuum years”, because the U.S. government of the day would have abused and de facto destroyed the international law system created after WWII, while being incapable of providing an efficient and socially and politically responsible alternative. 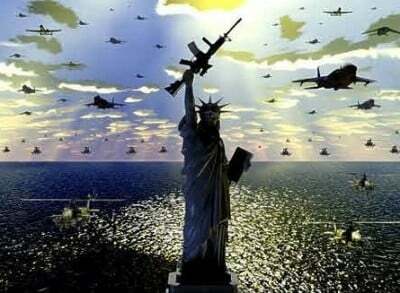 In fact, the U.S. neocon-inspired U.S government of the last twenty years has been unable to match its world empire ambitions with concrete solutions and workable institutions. This is not a good record, far from it. On Tuesday, November 4, American voters had their say about the U.S. elected officials who have been behind the mayhem and destruction brought to Iraq and Syria, and also Libya, by their failed policies. Indeed, the November 2014 mid-term election was dubbed a “referendum on President Barack Obama“, focusing on his competency, coherence and relevancy, but also on the weak state of the U.S. economy. The electoral results have not been very good for democratic candidates who paid a heavy price for their president’s failures. With both the House of Representatives and the U.S. Senate now under firm Republican control, it is obvious that the last two years of the Obama presidency will be difficult for the embattled “lame-duck” president. Dr. Rodrigue Tremblay is an internationally renowned economist and author, whose last two books are: The Code for Global Ethics, Prometheus Books, 2010; and The New American Empire, Infinity Publishing, 2003. To read Dr. Tremblay’s blog, please visit: http://www.thenewamericanempire.com/blog.htm The author can be reached at: [email protected].